OLIVES! I LOVE them, well, most of them. I eat them plain, seasoned, in salads, on pizza, in eggs, as a spread, and many other ways. I find them to be great for adding flavor to just about anything. The little buggers are so packed with flavor, a little goes a long way making them an economical way to spruce up your dishes. Don’t be afraid to buy the expensive fresh olives from the olive bar, as they last a long time (months) in the fridge, at room temperature as long as they are covered in their brine and years in an un-opened jar in the pantry. The one way they disappear fast is to put them out by themselves on a tray. They DO not last long at all around my family. Yummm. I guess I know what I am having for Breakfast this morning! What are olives? They are the fruit grown on the Olive Tree mostly found in the Mediterranean Countries as well as some from California. They are oval to round and have a fleshy exterior under their skin with a pit in the center. Green olives are the un-ripened olive and black olives are the fully ripened olive, olive varieties can range anywhere in between. All types are cured and brined before packaging and selling. They are not eaten raw off the tree. Cooking with olive oil in lieu of other fats (butter, other oils, etc..) can give provide and health benefits due to its high content of heart-healthy monounsaturated fats. It is also very well tolerated by the stomach making its protective properties a beneficial effect on ulcers and gastritis. There are a ton of varieties, brining and curing methods/flavorings. I am not going to list them all and I apologize if I miss your favorite. Below are some of the common types of olives found in local grocery stored, either in jars, cans, olive mixes and/or the wonderful olive bar. If using in a recipe, it is wise to buy the pitted olive, vs the olive with a pit, as pitting an olive can be time-consuming and frustrating. Before you fill that container or toss that jar into your cart – make sure it is the pitted olives. If using in an olive tray or antipasto tray – by all means go for the pit! Green Cracked olives are a colossal oval, un-ripe green olive that are stone cracked to allow a marinade of spices and olive oil to penetrate and enhance the flavor. Manzanilla Olives are a green variety Spanish olive with a crisp flesh and a smokey flavor. They are packed in a lactic acid salt brine cure and are small to medium in size. These are the typical olives you will find stuffed with pimentos and sold in jars. Nafplion is a firm un-ripe green – brown medium sized dense Greek olive with a crisp and slightly bitter flavor. It is typically cracked to allow the brine to penetrate and enhance the flavor. Picholine Olives are a French green olive that is salt-brined sometimes packed with citric acid in US. Has a subtle and lightly salty flavor. Seviliano & Green Spanish Queen Olives Are from southern Spain (and California) colossal in size, fleshy, crunchy and sour. They are pitted and usually stuffed. You will also find these in your olive bar and in jars. Sicilian-Style Olive (California Sicilian) is a large green olive with a medium-firm flesh marinated in Italian herbs and somewhat salty. Atalanta Olive is a green olive with a soft flesh with a muddy-green color. Kalamata (Xydates) Olives are from the Peloponnese region of Greece. They are almond-shaped and range in color from black, green, purple in color depending on the stage of ripeness they are picked. It has a medium-soft flesh marinated in vinegar and olive oil revealing a sweet-sour taste. Greek Black olives are round, have a tender flesh and shiny black skin with a fruity flavor. Very common to the Greek table. Gaeta is a small, round, meaty olive from Italy and can very from black to brown-gray in color. It is dry-salt cured, then rubbed with oil creating a wrinkly appearance. It is medium in flavor and typically packed with herbs, such as rosemary. Liguria Olive are salt-brine cured olive from Italy with a bright flavor and can be packed with stems. Mission olive is they fruity fleshy black olive commonly found at taco bars and on pizza. It is canned whole, pitted, sliced, etc.. This is not my favorite. Squeeze it out. If the olive is somewhat ripe and has some give, you can take your index finger and thumb to the bottom 1/3rd of the olive and squeeze. The pit should just POP out. Smash it out. If the squeeze does not work or the olive is slightly firm, you can generally take the flat side of a chefs knife, place it over the olive and with the heal of your hand, give the blade a little whack. that should loosen the pit enough to squeeze it out. Cut it out. For the stubborn olive, you are just going to have to cut it out. Take a small paring knife, slice down one side until you hit the pit (ha ha), then turn the knife and cut around the pit until you have a “butterflied” olive. If that doesn’t work and presentation doesn’t matter, just slice down each side until most of the flesh is removed. I typically always cook with olive oil… sometimes, a 1/2 olive oil and 1/2 butter depending on the flavor I want to accomplish. Most restaurants use a combination of olive oil and a vegetable oil when cooking, mainly for cost purposes. 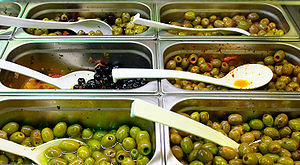 As with olives, there are as many varieties of olive oils. I won’t go into the brands, but will discuss the types. Keep in mind, there is a big difference in they type of oil to use for cooking vs the type to use for salads, bread dips, etc. The more fragrant and flavorful the oil, the better to use in salads and dips because the cooking of the oil will cause the oil to lose that wonderful fresh olive flavor. Save that expensive oil for un-cooked dishes and preparations. Olive oil needs to be stored properly. Up to 6 months in a cool dark place or up to a year in the refrigerator, as with all oils, it can go rancid if not stored properly or kept too long. Extra Virgin Olive Oil – This is derived from the first pressing of the olive using mechanical and should have less than one percent acidity and pressed without the use of chemicals. It is a deeper green color, rich in flavor and aroma. The lower acidity signifies a higher quality oil making it the more expensive and prized variety of olive oil. Extra Virgin has the highest health benefits and the variety you want for salads, dipping, tossing with fresh pasta and finishing dishes. If you cook with it, keep in mind it has a lower smoking point than plain olive oil. Virgin Olive Oil – Is derived from the first pressing of the olive using mechanical means without the use of chemicals with an acidity content of up to two percent. While this has good flavor, the higher acidity makes it less fruity and lighter in color to the extra virgin oil. This also makes it less expensive than the extra virgin olive oil. This is a good choice for sauteing. Olive Oil (or fine Olive Oil or Pure) – Lowest quality of olive oil. This oil is extracted during a second pressing of the olive. The olive is can be treated with heat, pressure and chemicals. The resulting oil can be combined with virgin or extra virgin oils resulting in the garden variety of “Olive Oil”. It does not have much flavor and is generally used for browning, frying or high temperature cooking. Light/Extra Light Olive Oil – Undergoes even more processing than the Pure Olive Oil and does not contain or not cut with virgin or extra virgin olive oil. There is little flavor or benefits to the light oil. Light means light in flavor, not calories. It is un-regulated and therefore can be cut with other vegetable oils. STEER CLEAR! Cold Pressed – Means no chemicals were used in the process of extracting the oil. Estate – Means that the olives were derived from a single farm and not a blend of multiple oils. Unfiltered – Means that the oil was not siphoned through a filter to remove sediment. This may lead to visible sediment at the bottom of the bottle. What we have all been waiting for: OLIVE Recipes! Warning: Olives contain a lot of salt. Most likely you will not need ANY salt. Do NOT add salt until after you taste. Bread Dip: Use your most expensive flavorful extra-virgin olive oil. Pour in a dish and serve with fresh warm Italian or french bread. Additional options, Pour in a few drops of Balsamic vinegar, Red Wine Vinegar; Marinate with fresh crushed, torn herbs; I love garlic – you can crush a clove and pour the oil over it for dipping, or crush the clove and rub on the warm bread before dipping. Traditional Tapenade: 3/4 cup pitted kalamata olives; 4 large garlic cloves, 3 anchovy filets; 1 TBS capers (drained), 1/2 cup packed fresh parsley or basil, 1/2 – 2/3 cup extra-virgin olive oil, 2 TBS fresh lemon juice, 1/2 tsp fresh ground pepper. Put all in a processor and process until desired consistency or chop all finely then add the lemon juice and oil. Pizza Topping: The ideas are endless. Use the tapenade in lieu of tomato sauce; Sliced black olives with hamburger and onion; Sliced kalamata olives with feta cheese, oregano and basil/parsley; green olives, roasted red peppers, onions; green or kalamata olives with artichokes and feta cheese; Just sliced olives; the list can continue. Tomato and Chicken: 1/2 cup chicken stock, 1/4 cup of white wine, 2 TBS olive oil, 1 LB chicken tenders cubed, 1 TBS flour, 1/2 cup sliced olives, 1/2 cup diced onions, 3 cloves diced garlic, 3 Roma tomatoes diced (or one can diced tomatoes), parsley, salt and pepper to taste. Heat the olive oil over med-high heat and sauté the onions for about 2 minutes. Add the garlic and sauté for an additional 1 minute. Dredge the chicken in flour seasoned with salt and pepper brown on both sides remove to plate. Add chicken stock and white wine, scrape up bits and let simmer and reduce by 1/2. Add tomatoes and olives and let reduce again, tasted and adjust seasoning. Add back the chicken and simmer for about 2 – 3 minutes until chicken is done, finish with fresh parsley/basil. Serve over pasta or with rice. Egg Salad: I LOVE egg salad/deviled eggs with green spanish olives and pimentos. It just adds so much flavor! for a single over stuffed sandwich – take 3 hard boiled eggs (smashed/chopped), add 1 TBS mayo/miracle whip, a turn of fresh ground pepper, and about 2 TBS roughly chopped Queen olives with pimentos and pinch of fresh parsley. Mix well. You can also add diced celery, paprika, cayenne and/or additional mayo if needed. For making the deviled eggs, just mash the yolks and sprinkle with paprika and stuff the white portion. Stuffed and Fried: You can take any Colossal Green olive (the Queen is preferred), stuff it, then bread it and fry it for a great appetizer. If you refer back to the top of this post under the Green Olives, I list a number of stuffings. Take anyone you wish, pipe into the olive then bread: For the 3 step breading: four, whisked egg, Italian breadcrumbs. Roll the olive in the flour, then the egg mixture and finally the breadcrumbs. Set aside and heat the oil (in a pan deep enough for the olive to be submerged in the oil) to about 350 degrees. Place a few at a time into the oil and cook until golden brown. Drain on paper towels and serve warm. You can make in advance and re-heat in the oven at 350 degrees until warmed through. I hope you all enjoy this post and keep this in mind when planning that next party! There are so many uses for the olive, I have not even breached the ideas and possibilities. Next time you want to kick up that chicken, fish or pasta dish – keep this little gem in mind. Posted by culinaryease on January 9, 2011 in Cooking for two or less, General Cooking, Parties, Appetizers, and More, Recipes, Vegan/Vegetarian and tagged Kalamata, Olive, Olive oil, tapenade.